The killing of Yemeni military intelligence chief in a Houthi drone attack sheds the light on the developed technology of suicide operations that the Houthis carry out against the legitimate forces and the Arab Coalition through small unmanned jets and boats. On January 10, 2019, a small drone managed to reach the most important military leaders and exploded over a military parade in Al-Anad airbase in the southern governorate of Lahj, killing six soldiers and two officers. The new death technology that has become in the hands of Houthis creates an urgent need to find answers to an important question: Who supports this primitive group with all this dangerous technology? Will this open the door to destructive wars relying on the weapon of technology, not relying on expensive weapons? The Houthis turned to power in September 2014 as rebellious armed militia that fought six wars against the government, from 2004 to 2010. It seized the weapons of the Yemeni Army and established parallel institutions of the state. They also controlled key institutions, changed officials and imposed loyal observers in each government institution. In March 2015, the Saudi-led Arab Coalition announced the beginning of a military operation in Yemen to restore the legitimacy, led by President AbdRabbo Mansour Hadi, from the coup, led by pro-Iran Houthi militias. After nearly four years of war and due to geopolitical considerations, there is a clogging in the battle with the Houthis, who worked throughout the war on developing their weapons. This study, which is the first research on the Houthi UAV weapon, in addition to a previous preliminary study issued in early 2018, summarizes this dangerous technology that is owned by the first armed group outside the state in Yemen, especially since the Houthis, after their attack on “Al-Anad”, has announced that they are seeking to build a large stock of drones as their strategy in the war. Yemen’s space witnessed the first model of UAVs during the US drone operations that began in 2002 to attack al-Qaeda in Yemen. After the intervention of the Arab Coalition to confront the Houthis, UAVs were used to survey the country. Until 2018, Chinese drones, owned by the United Arab Emirates, successfully attacked one of the Houthi leaders, Saleh al-Sumad, president of the so-called Supreme Political Council. The killing of al-Sumad was a shock for the Houthis. More than a year before he was killed, al-Sumad visited an exhibition of UAVs, which the Houthis group claimed it had manufactured them locally. In February 2017, the Houthis revealed that they possessed locally-produced drones to carry out combat, reconnaissance, surveying, assessment and early warning missions. Following the killing of "al-Sumad", the Houthis announced that they possess different drones (Sumad 2, Sumad 3, Qasef-2M). As the Houthis declared a "special unit" for military manufacturing and ballistic missiles development. They announced what is called as the "UAVs Air Force", which carries out the Houthi UAVs attacks. According to the mission of such drones, they can be divided into reconnaissance and suicide drones. There are three drones the Houthis use in the reconnaissance missions, "Hudhud", "Hudhud 1", "Raqib" and "Rased." • The Hudhud, 150 cm long and wing length 190 cm, can stay up to 90 minutes in the air, within 30 km. • Raqib, body length 100 cm, wing length 140 cm, stay up for 90 minutes, range 15 km. •Rased, body length 100 cm, wing length 220 cm, flying for 120 minutes, range 35 km. • These drones accompany the Houthi elements to depict the location of the enemy forces before launching ground attacks on military positions. • Correct the artillery course, and provide the coordinates of the positions of the military forces. These drone look very close to the models of Iranian drones that they used during the war with Iraq in the 1980s in Mahabad such as “Tlash 1” and “Muhajir 1”. These drones have a single mission and they fly according to specific coordinates to reach and detonate either remotely or via timing of coordinates. The Houthis initially launched "Qasef-1" drone and later, after the killing of "al-Sumad", the Houthis launched "Sumad 2" and "Sumad3" drones. While there is little information about the drone “Qasef-1”, which was intercepted by the UAE forces in the south of Yemen after it was submitted to research centers, the other two models of drones have not been disclosed except that their range is more than 1,000 km, and that they can stay 24 hours in the air. The operation in Al-Anad was the first operation to be carried out by drone "Qasef-K2". There is no much information about it, but it resembles "Qasef 1" generation. Qasef-1 drone should be studied to learn how the Houthi suicide drones work. The drone has a range of 150 km, a body length of 250 cm, a wing length of 300 cm and flying for 120 minutes. It can carry a warhead weighing 30 kilograms. According to sources of the Abaad Center in the Yemeni Army, the Houthis use explosives of (TNT, C3, C4) in these suicide drones. Houthi drones were shot down in Sa’ada before explosion. The Houthis said that their drones are provided with a smart system to monitor, identify and then strike the target and that they carry several models of warheads according to the mission. The mission of Houthi drones are similar to the mission of "Japanese aircrafts" in the World War II, which was called "Kamikaze"  where the pilots fell with their aircrafts on the US Naval battleships in the middle of the ocean. The sudden attacks caused the American Army more than 4,000 soldiers. The difference is that aircrafts are now unmanned with less destructive capability. The drone reaches a height of 20 meters above the target and then explodes or falls very fast on the target. On January 20, 2019, the Arab Coalition announced that Iran had supplied the Houthis with S-129. This model of drones has very large capabilities. In addition to the survey function, this drone can carry eight guided missiles. The range of this drone reaches 2000 km and it can return to its yard. It can stay in the space for 30 hours to do monitoring functions and attack the targets simultaneously. Tehran unveiled this generation of drones in 2012. It is the backbone of the Iranian drone production over the next decade. Iran has already used it in Syria. • Targeting the Patriot defense systems that Saudi Arabia has deployed on borders in order to open the way for ballistic missiles the Houthis launch against the Kingdom. • Targeting airports: The Houthis targeted Saudi Abha airport in April 2018 with two drones "Qasef-1". The Houthis announced in August and September 2018 that Abu Dhabi and Dubai airports had been targeted by "Sumad 3" drones, but the UAE denied the attack. • Targeting oil installations: In July 2018, the Houthis announced that they targeted Saudi Aramco Oil Company with "Sumad 2" drone. • Government forces: The Houthis continue to target government forces, particularly in the West Coast and Nehm front, near the capital Sana'a. • Targeting military leaders: as happened in the targeting of military leaders in Al-Anad military base. You can get a deadly drone for one thousand or two thousand dollars as the cost of this kind of smart weapon is very low and materials for manufacturing this weapon are available on internet. • Drones are small in size, difficult to be detected through radar. • Carry accurate cameras for photographs or maps. • The Abaad Center for Studies and Researches has got images of two drones that have been shot down in Marib and Al-Jawf, east and north of the country, as well as other images of the structure of drone that attacked military leaders in Al-Anad and found that these drones have engines (DLE111) and are attributed to the Chinese company (DLE), which has distributors in more than a country including Iran, and these engines may be remotely controlled. • By tracking the quality of the fan, it resembles a fan of a brand called "XOAR" for the German Beechwood Company. The fan costs $ 250. The company has distributors in Yemen and other countries, in addition to the possibility of buying such fans through internet. • The Houthis make the body of drones from fiberglass because it is light. The way of manufacturing fiberglass is available on internet. • The engine costs only $600 and can be purchased via internet, so the manufacturing of this model of drones is low-cost. How do UAVs reach the Houthis?! The Houthi group has been in constant wars since 2004 and it depends on the recruitment of children or uneducated people. The doctrine of the group in warring and fighting and its way of targeting people and convincing them to join the group have repeatedly confirmed that the group is far from drone technology. Thus, Iran, the Houthis’ ally, is the only one that is capable of supplying the Houthis with this model of technology. • The first way: smuggling drones to the Houthis. Security forces in Marib (east of Yemen) repeatedly reported the capture of UAVs en route to the Houthis. This is confirmed in a report from the Center for Arms Control in March 2017. After studying Houthi-controlled drone "Qasef-1", the report points out that the serial numbers and designs indicate that it is only another form of the Iranian drones known as "Ababil". The center depended in its analysis on seven drones. Six of them were captured in October 2016 on an Iranian smuggling route passing through Oman, while another drone was found after a Houthi attack near Aden in February 2017. The serial numbers indicate that another drone was shot down by Iraqi forces during battles with the Islamic State Organization “Daesh”. The drone was used by the Popular Crowd Forces in Iraq but it fell into the hands of Daesh that managed to re-use the drone before being dropped down by Iraqi government weapons. In smuggling weapons, including parts of ballistic missiles and drones, Iran depends on two groups, the Unit 400 and the Unit 190 that are affiliated to the Quds Force. The latter is responsible for smuggling weapons and modern technology for wars outside the borders of Iran. Since the 1980s, this unit exploited all the state’s capacities (aircrafts, ships, intelligence and politics) to form large weapons smuggling networks that include generals, security, naval and military commanders on the longitude and latitude of the geopolitical map of the Middle East. The first appearance of these boats was when the Houthis attacked a Saudi frigate “Madina” on the Red Sea on 29 January 2017 with three boats that were initially said to be suicide boats with Houthis on board, but in fact they were unmanned boats. The unmanned boats were loaded with explosives to destroy the Saudi frigate. One of the three boats managed to collide with the rear of the frigate killing two Saudi soldiers and injuring three others. The other two boats were destroyed before they reach the frigate. The Houthis also targeted an Emirati ship in Makha with this kind of boats. The unmanned boats have not been used only for targeting the ships and battleships of the Arab Coalition in the Yemeni waters, but the attack also extended to economic interests within Saudi territory. In April 2017, the Houthis targeted the quay of the Aramco Oil Port in Jizan with a remote-controlled boat, but the Saudi Navy said it had foiled the attack. In July 2018, Saudi Arabia said the Houthis targeted a Saudi oil tanker as it passed through the Red Sea. While the Houthis said they targeted the military "Dammam" battleship. This incident prompted Saudi Arabia to halt the passage of oil shipments through the Bab al-Mandab Strait for more than a month. The Arasan oil tanker was hit on the back on the water surface. The image analysis showed a hole of two to three meters wide and a small damage caused by fire in the external structure. The most likely reason was the launch of a large unguided missile from a rapid boat that was behind the tanker. Later, the oil tanker, which was able to use its own capacity at a reduced speed, was escorted to the Saudi port of Jizan. It was accompanied by the Saudi frigate "HMS Dammam" which (in contrary to so far reports) was not affected by the Houthi attack. It is a cargo ship anchored on the archipelago of Dahlak on the Red Sea. It is believed to be owned by the Iranian army. It reportedly conducts logistical support for the Houthi group through providing data and information to the armed group in Yemen or manufacturing drone boats to be controlled from the ship or by Houthis on Yemeni territory. There is no clear evidence of what Saviz does, but the ship certainly plays a tactical role in the war in Yemen. • In November 2017, the Saudis documented a suspicious activity by Saviz, including the image of Saviz with three speedboats similar to those used by the Houthis, on its deck, forward from the ship's bridge. 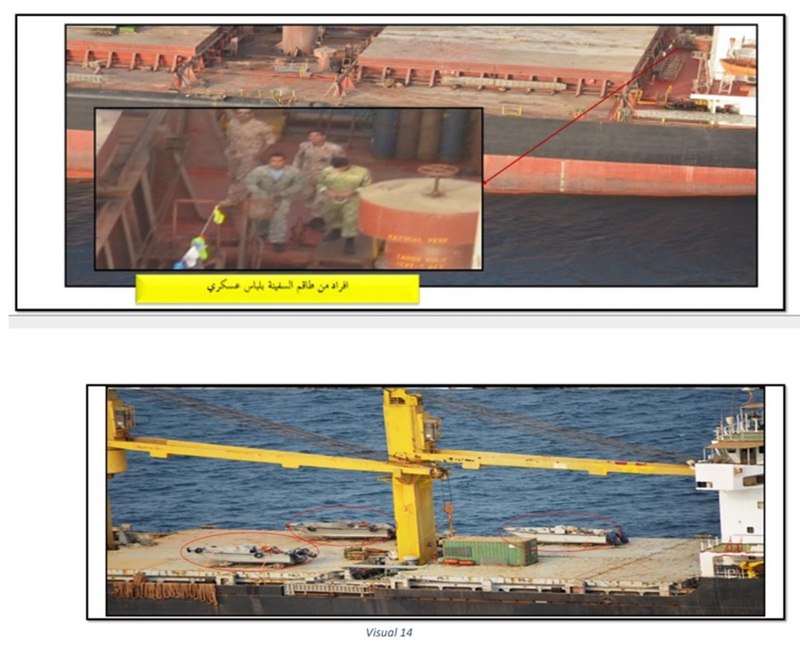 The same document showed another unnamed Iranian merchant ship with crew members who appear to be military personnel. • Through the available information: "Saviz" ship has worked in the past within the Iranian arms smuggling network. The ship, which was installed in 1999, operates in the name of Iran Lurstan, but it was included in the United States and United Nations sanctions in 2007-2008 as an asset to known arms traffickers in Iran, including the shipping company: Rabaran Omid Daria Ship Management and its owner is Ojia Anos Khorushan. • Saviz was placed on the sanctions list in 2012, but in 2016, in order to make a progress in the Iranian nuclear agreement, the sanctions were lifted by the Trump administration. Saviz was accused of conducting covert operations in the region in favor of Iran. • A ship such as Saviz can carry command and control elements of the Iranian armed forces, provide logistics, and control the activities of smaller vessels. The weapons of the Houthis may put the ports and airports of the Gulf States under serious threat. The sources of oil companies, vital factories, energy production companies, oil refineries and water desalination may be adversely affected, especially in Saudi Arabia and the UAE, which lead the military coalition against the Houthis. 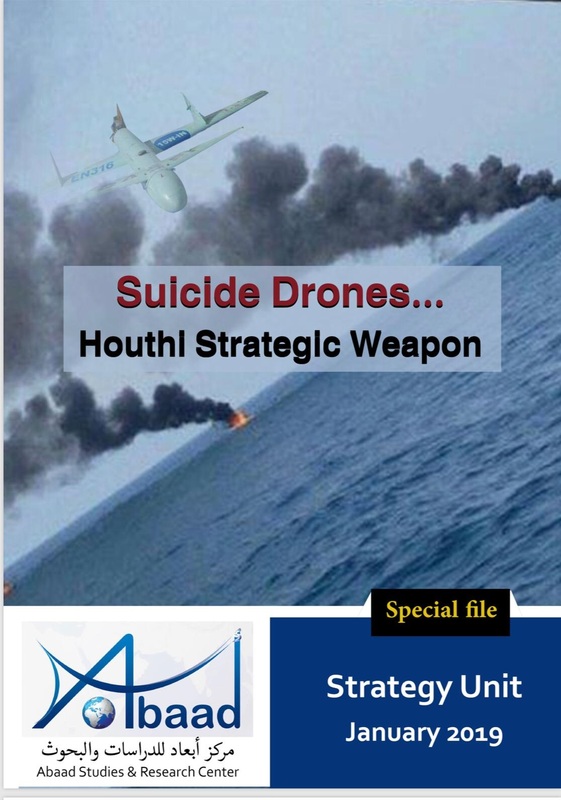 • Houthi's drone weapon, both reconnaissance and suicide drone, along with suicide boats that threaten international shipping corridors, has become a strategic weapon for the group that could be developed to pose a big threat to regional and international security. • The arrival of such technological weapon to the hands of the Houthis threatens the peace process in Yemen and imposes a military reality by force. This technology with the Houthis may be used in future political assassinations if the Houthis are involved in the government without a military defeat while they remain strong as armed militia. • The remaining of this technology in the hands of the Houthis group means another Hezbollah in Yemen. The Houthis group may seek to form other sectarian organizations in the region and supporting them with drone weapon to achieve a rapid balance of power with the regimes that target it. It is believed that experts in Shiite organizations in Saudi Arabia and Kuwait have become able to deal with the technology of drone weapon. • The pro-Tehran militias that possess drone weapon have become a force in the hand of Iran today and it will use them for pressure in any future negotiations. • Sanctions against Iran are expected to be tightened to a complete ban on the possession of drone weapons technology and a ban on the Saviz ship, which is believed to provide logistical services about this technology to the Houthis. • Companies producing remote control engines should know the need to develop strict control systems on their products similar to control systems for sophisticated weapons. Saudi Arabia is expected to do so in cooperation with the United States. • The arms market will witness a qualitative development of the advanced defense systems that catch drone planes and boats before they reach military targets. The arms market will also witness an economic revival due to the high demand of this defense system. • Companies for producing drone weapon maybe established in poor countries by multi-purpose groups and organizations, so weapon in the future will be the technology of drone weapon. Future wars will not depend on expensive weapons, but on digital expertise and technology.